Hurricane Nate To Hit New Orleans At Category 2 - Joe.My.God. A swiftly moving Hurricane Nate strengthened in its race toward the U.S. mainland Saturday and is expected to be a Category 2 hurricane when it strikes the U.S. Gulf Coast between southeast Louisiana and Florida around midnight. States of emergency were declared in Louisiana, Mississippi and Alabama as Nate — which has already killed at least 21 people in Central America — became the latest in a succession of destructive storms this hurricane season. 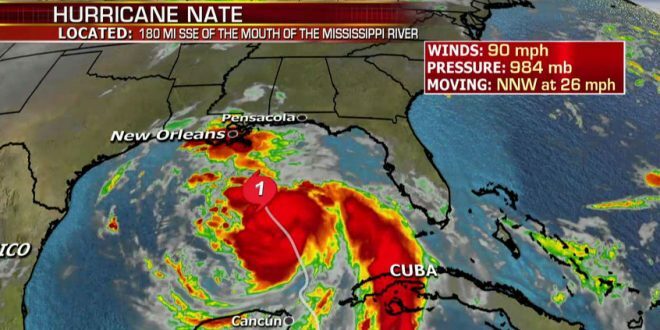 The National Hurricane Center has issued a hurricane warning for metropolitan New Orleans and Lake Pontchartrain and a coastal stretch from Grand Isle, La., to the Alabama-Florida border. A tropical storm warning was in effect east of the Okaloosa/Walton County Line in Florida to Indian Pass, Fla.
As of 10 a.m. CDT, the National Hurricane Center said Nate was 180 miles south-southeast of the mouth of the Mississippi River, moving north-northwest at a 26 mph clip, bearing maximum sustained winds of 90 mph.